A delicious low carb keto shortbread cookies recipe. Great for shortbread pie bases also. 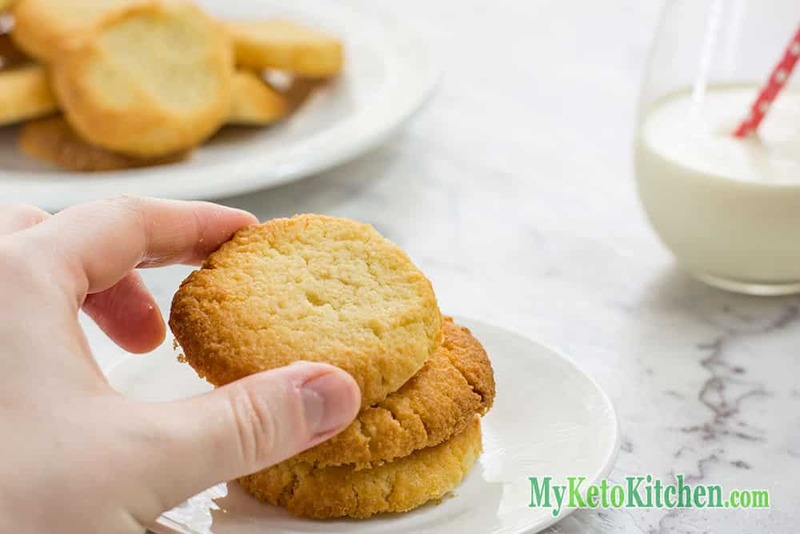 Keto shortbread cookies are a great snack, staying low carb when enjoying them couldn’t be easier. Check out more Tasty Cookie Recipes. One batch of these keto cookies make the perfect base for our Low Carb Jello Chunk Cheesecake. Make yourself a double batch so you’ve got a tasty keto snack to eat while you wait. This low carb shortbread cookie recipe makes 16 cookies, 1 serve is equal to 1 cookie. Ready to eat Keto Shortbread Cookies. 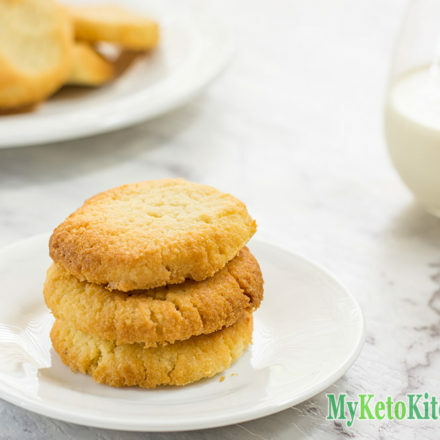 Keto Shortbread Cookies - Low Carb Vanilla - EASY to make! 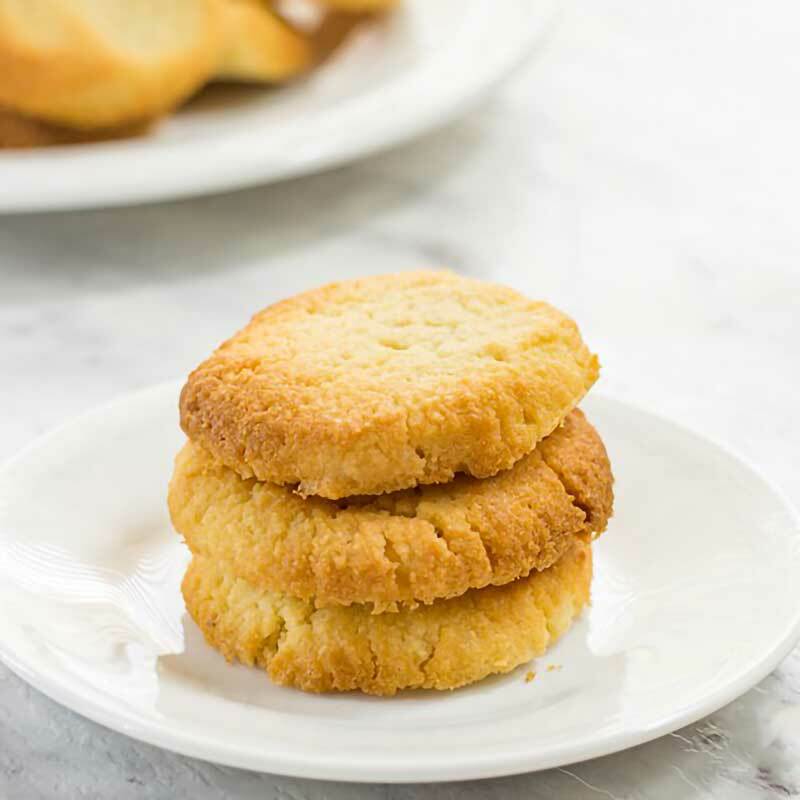 These Keto Shortbread Cookies are the closest I’ve come to a low carb buttery, crumbly and sweet pastry base as well. They make an excellent snack and a great base for our low car pie recipes. We make a lot of different keto cookies through using low-carb flour alternatives and natural sweeteners. 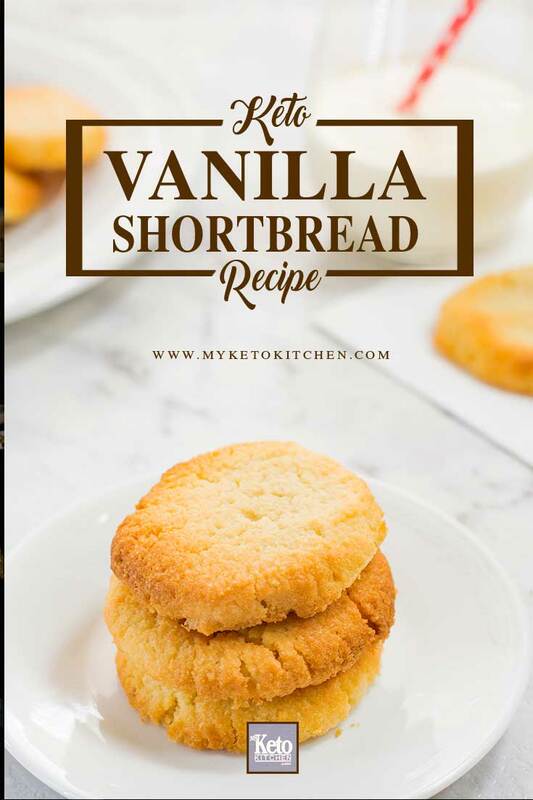 If you want to make a larger batch of low carb vanilla Keto Shortbread Cookies, simply adjust the serving amounts in our easy to use recipe card above. I made these this morning and used good coconut flour from the health food shop. They were very dry. It was all I could do to keep them in a ball on the cooking pan. No spreading in the oven. No sticking to the hands. I liked the look of the recipe because it didn’t have a lot of eggs (ugh) in it. Didn’t work for me but hopefully they will taste ok. Sorry that the cookies didn’t work out for you. The recipe does call for almond flour, using coconut flour would explain why they were so dry. For best results, make them using almond flour; coconut flour requires using less and adding extra eggs and liquid and can’t be substituted for almond flour without making adjustments to the recipe. I just made these so so good! Except when I imput all the ingredients into my tracker it’s nutrition facts are way off!! Did I do something wrong!? I ate 3 thinking 1 carb each but my fitness pal recipe maker says 6.5 each!! Help! why do people always substitute other ingredients in recipes, then when things don’t turn out right, they complain about the recipe? Makes no sense at all. Oh doh! That will teach me to try to cook early in the morning. You know I even checked that! Of course that’s the problem! The second bake with added egg and water wasn’t much better and still crumbly as you would expect but do you know it tasted quite nice so I have put the biscuits in the freezer and I reckon it will make a lovely tart base if I mix it with some more moisture and bake it again. Thanks for replying Gerri and know that I promise to triple check recipes from now on! Can l use Stevia better? I haven’t tested the recipe using stevia, but I’m sure that a granulated or powdered version would work fine. Hi, l’m going to make it today but l have a question. Can l use almond meal flour? Almond Meal will work fine, your cookies may be a little bit grainy due to the large grind of the almonds. I just made these for my hubby. They are delicious. Reminds me of a Christmas cookie. He will love them. Thank you very much. How do we know how many carbs in ea serving ? The nutritional information is listed under “Recipe Notes” at the bottom of the page. If you can’t see it than you might be viewing our page as an AMP page, just scroll to the bottom and click View Non-AMP to see the nutritional information. can you substitute Splenda for the erythritol? I haven’t tested it, but I don’t see any reason why it wouldn’t work! I just made these! Delicious!! I put a dab of avacado pudding that I kept a bit stiff for spreading. Awesome treat with my evening tea! Thank you for sharing!! Thank you for you kind words Maureen! COMMENTThese are really good! Thank you so much! Perfect with my coffee! Has anyone tried these without xylitol or erythritol? My leaky gut doesn’t handle sugar alcohols yet so I usually use a smidgeon of honey (for flavor) with stevia and monk fruit. Hesitant to try these in a cookie, as well as it works for pies and cakes. The erythritol adds some bulk to the cookies as well as sweetness. I would recommend replacing it with a granulated sweetener that your gut can handle. I made this recipe yesterday…very good result and I used Stevia brown same amount as you had indicated with erythritol. Thank you for your kind words. I’m glad you enjoyed them! I made them with erithrytol this morning and found them just a bit sweet (not used to sweet stuff on keto). I would reduce to a quarter cup and then they’ll be perfect. That said, the recipe is excellent. Just wondering how long and how to store these? Thank you! You can store them in an airtight jar or container at room temperature for up to 2 weeks. I’ve just finished baking them and they are absolutely amazing! I used peanut flour instead of almond and powdered Stevia and it came out delicious! Thank you for the recipe. Thank you for your kind words Keila! How many cookies are in a serving? These were insanely good. Change nothing, and they will blow your mind. My family of 5 will eat these in no time, and I’m the only keto in the group. INCREDIBLE! That’s great to hear Lori! I just made this and they were great! Thanks for sharing your recipe! These are Amazing!! They taste even better straight from the freezer. Thank you for your kind words Alannah! Thank you, Heidi, so glad you enjoyed them. This is a perfect keto shortbread recipe. I used powdered swerve (erythritol blend) and added a little stevia to add sweetness. I also used a high quality Irish butter called Kerrygold. The results amazing!!! It did not crumble, it was moist and decadent. We love Kerrygold too! I’m glad you enjoyed the shortbread. Awesome recipe! I used almond extract instead of vanilla (I was out!) and Lakanto monk fruit sweetener with erythritol, and they tasted like almond paste shortbreads! Next time, I’m trying lemon extract, and I’ll dust them with some powdered Stevia. Thanks for a delicious recipe! Glad you enjoyed it. I’ll pass it on to Gerri and see if she can’t make some like yours, they sound very tasty. Hi! I have no erythritol in my country.. can i subtitute it with 3 grams of sucralose sweetener? This recipe needs a granulated sweetener as it provides some bulk to the recipe, you could use xylitol instead. If you want to experiment with using the sucralose, please let us know how the cookies turn out. Was not sweet enough for me. Rather like a biscuit. I dusted them with a good quality Stevia powder and they were good. Great pie crust dough. I just tried them with Stevia. They turned out great but are a little too sweet with the Stevia. So if you’re using Stevia instead I would use 1/6 cup stevia. I’m going to also cut the vanilla down a bit next time. I love the recipe though and the cookies turned out great. Thank you so much Justin time for Christmas! Did you use powdered or granular erythritol? Can I use Swerve instead? Granulated and yes, you can substitute for swerve. Just made these cookies and they tasted delicious. Just was wondering if it was supposed to be cakelike soft or crispy? The cookies are similar to shortbread, a little crispy on the edges and soft, but firm in the centre. I hope that helps. Thank you for your kind words, Randi! Hi Gerry, thank you for opening this recipe! Do you happen to know if this dough can be used in a cookie press? Or is it too sticky? I don’t think it would be suitable for a cookie press when the dough is raw. If you are determined to press them, you could try stamping the cookies halfway through the baking. If you do try, let me know how it turns out. This is very similar to several keto “sugar cookie” recipes that I’ve seen, but this one has about double the butter. Wondering your about your thoughts on whether these would be good cut out cookies. I don’t see why not, but I figured I’d ask if you’ve tried it. More butter makes a better shortbread cookie! The cookie dough is quite soft and is not suitable for cookie cutters. Thank you for your kind words and Merry Christmas to you also! Made these tonight and they were SPECTACULAR!!!!!! Made These tonight and they were Spectacular!!!!! Delicious! I just made these, and they’re very good. For reference, I used granulated Pyure (it’s a erythritol and stevia blend) which I think is sweeter than plain erythritol, so I went just shy of 1/3 C. I also used salted butter and just omitted the extra salt. They’re wonderful cookies! First if all, I DON’T bake. I’m on my 8th day of Keto and was hAngry for something with Pecans. Bought most of the ingredients on Amazon (I DON’T like shopping either)… I was thrilled to come home to everything today and have everything I needed. J was hopeful but not sure if they would fix my craving. Well HOTT Da*n, they we’re no less than a decadent . I wish I could show a photo of how they turned out. I HIGHLU recommend trying these. Huge Fan! I’m so glad you liked them Dayna! Thank you for your kind words, you’ve made my day! Third time making these cookies. 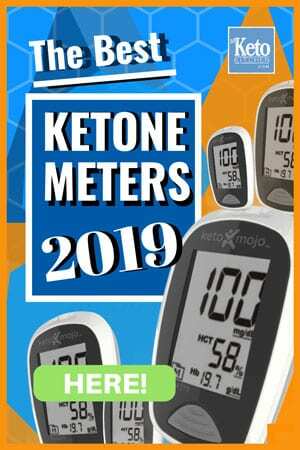 Absolutely love them, and I get them stolen by the “none keto” members of the family, who “mock” my keto diet plan. Eat your own biscuits I say, and keep your hands off mine! These cookies are delicious. I made them with monk fruit sugar, added a little extra vanilla extract and about a tablespoon of ghee. They came out perfect. Thank you so much for this recipe. I have been able to stick to my lazy keto diet because of sweet treats like this. A great keto biscuit recipe so glad I found this, curbs the cravings!